Home Blog WIN A trip to Disney World in Florida! 4 One-Day park Hopper passes—Disney World, Magic Kingdom, Epcot, Disney’s Hollywood Studios and Disney’s Animal Kingdom! A 7 day stay at a Wyndam/RCI Hotel or Resort, you choose! $800 Delta eGi; Card to apply toward your flight! You do not have to be present to win. Online ticket sales close April 29 at noon! All tickets, paperwork, necessary codes, phone numbers, written guidelines and restrictions will be provided to the raffle winner on or after the drawing during Strike Out Sarcoma April 30, 2016. 4 Complimentary one day park Hopper passes valid at Walt Disney World Resort in Central Florida. Passes are valued at $155 per pass, a total of $620.00. The complimentary tickets are valid during normal operating hours and provide admission to a magical one-day experience at each theme park – Magic Kingdom, Epcot, Disney’s Hollywood Studios and Disney’s Animal Kingdom. Tickets expire within 2 years. Expiration dates are on the back of the tickets. Tickets provided for fundraising activities that are lost, stolen, used or expired cannot be replaced. Complimentary tickets may not be used for admission from December 25-31 of any year and may be subject to block-out dates. They may not be used for additional fees including baggage fees or for any other products or services including upgrades, in-flight purchases, premium seating, mileage booster, SkyMiles Cruises, cargo, hotel stays or car rentals. If redeemed at www.delta.com, a maximum of three forms of payment including eGifts or Cards can be applied towards a single transaction regardless of the number of tickets purchased as part of that transaction. The laws of the state of Georgia without regard to its conflicts of law provisions, apply to these terms and conditions and use of any eGift or Card. With the certificate you can enjoy one 7-night vacation stay through Resort Rental, LLC (“RR”) resorts at which RR has inventory (such inventory includes RCI affiliated resorts). 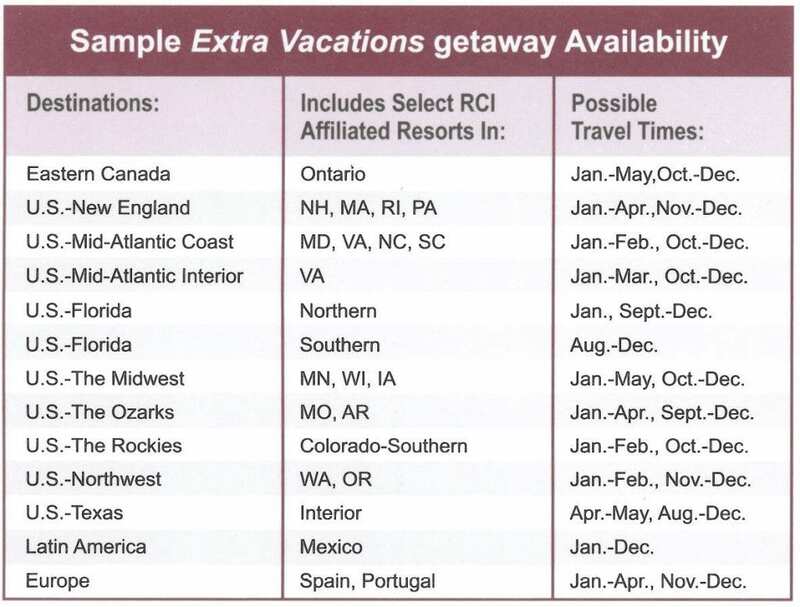 You can use the Extra Vacations getaway in any of the destinations and at the sample travel times listed on the back of the Certificate provided as well as other numerous destinations (all subject to availability). This offer does not include every RCI affiliated resort available through the RCI Weeks Exchange Program. No exchange of a qualified deposit is required. Call the number on the back of the certificate provided to redeem your Extra Vacations getaway. You must book and receive a written confirmation no later than 12 months from the certificate date of issue which was 11.10.2015. Certificate may be redeemed only by a redeemer who is a resident of the United States excluding Puerto Rico and where otherwise not prohibited by law. Requests can be made 2 to 365 days in advance of travel dates. More RCI affiliated resorts may become available as the start date draws closer. Available unit may be smaller than actual ownership week. You may apply a Guest Certificate for the applicable Guest Certificate fee. Extra Vacations getaway requests are subordinate to RCI Subscribing Member exchange requests.